If the actions of somebody else cause you to get hurt, why should you have to pay for things like property damage or medical bills? Not to mention all the money that you might lose out on from lost wages. Answer: you shouldn’t. When you are hurt through no fault of your own, the financial responsibility should lie with the parties responsible. Sometimes, that means the individual driver who crashed into you because she was drunk. Other times, it means the negligent company that created a defective product that caused you harm. And sometimes it means the insurance company that delays your claim despite you paying your premiums on time for years. The only thing that you should have to do when something like this happens is getting healthy and get back to your regular life to the extent that you are able. Unfortunately, it doesn’t always work that way. Even if other people or parties know that they are responsible and should do the right thing, that doesn’t mean that they will. Often, you have to fight for what you know you deserve, and most people have no idea how to go about doing that. Worried that there’s no chance of getting the money you need because your fight is against a giant corporation or big insurance company? That doesn’t matter to us – we’ve taken on the big boys before and we’ll happily do it for you if that’s what’s needed in your case. And unlike some personal injury lawyers, we’re not afraid to go to trial if that’s what’s necessary. We all want to believe that our insurance company has our best interests at heart – that we’re “in good hands” so to speak – the truth isn’t quite so nice. Insurers only want to keep people happy enough to prevent them from jumping ship to another company. Beyond that, they have a bottom line to protect, and if you’re filing a large claim, you’re cutting into that bottom line. They’ll look for any quasi-legal reason they can find to deny your claim, and if that doesn’t work they’ll low-ball you or delay for as long as possible. If you know that something should be covered by your policy and your insurance company is giving you trouble, Lawlor, White & Murphey can help. We’ve handled bad faith insurance cases for contractors, public adjusters, restoration companies, business owners, and homeowners in Port St. Lucie, and we can help you, too. Injured in a Port St. Lucie Car Accident and Need Help? When you get into an auto accident in Florida, you have what’s called personal injury protection, or PIP. From the name, PIP sounds like a good thing, but quite often when Florida drivers get into a crash they learn that the personal injury insurance the state requires them to pay isn’t going to come close to covering their medical expenses or making up for the money they lose while not working. We’ve all had slips and spills in our lives, and sometimes they happen because we’re clumsy or reckless, but not always. If you get hurt because of bad wiring or a step that’s loose, your landlord is responsible. It’s called premises liability, and tenants can sue for damages. This isn’t limited to apartment buildings, either. It applies to all kinds of property in Port St. Lucie, including airports, hotels, restaurants, retail stores, parks, malls, and more. The experts at Lawlor, White & Murphey have successfully handled all kinds of premises liability cases, and they can help you with yours as well. We also handle traumatic brain injuries, which can be caused by any strong or sharp blow to the head, such as one that might occur when a person falls. Additionally, they can be caused by contact sports, car accidents, and assaults. Victims of this kind of injury often require help for life or suffer a severe loss in their mental and physical abilities, leading to big financial problems for them and their families. Sometimes it’s necessary to take the responsible parties to court in these types of cases, but we understand that everything has to be handled compassionately to ensure that the victim’s dignity is maintained as much as possible. Port St. Lucie residents love the water, but most have no idea that incidents which occur in the ocean or other water channels don’t fall under the regular state laws. Instead, there is a completely separate area of law governing them — maritime law. What exactly does maritime or admiralty law cover? Everything from cruise ship accidents to international shipping. Because maritime law doesn’t play by the same rules as the laws most of us are familiar with, you need a specific kind of expert lawyer to handle your case. The attorneys at Lawlor, White & Murphey have more than 40 years of combined admiralty law experience, and we know exactly what to do to make sure that you have the best chance of a positive outcome in your case. Most people aren’t comfortable with the idea of suing over the death of a loved one – after all, it’s not going to bring them back. But when someone you love dies because a person or organization behaves in a reckless or negligent manner, you owe it to the survivors to fight back. First, because death is a cost that’s expensive not only in emotional pain, but also because of the high medical bills, lost wages, and funeral expenses that may be associated with it. And second, because going to court may be the only way to convince the guilty party to change their ways and prevent something similar from happening to another person. What is wrongful death? It can be caused by practically anything – a car accident, excessive use of force by a police officer, and even medical malpractice. In certain situations, it’s even possible that the party responsible will have to go through a criminal trial, but even if they are convicted of a crime, this doesn’t do anything to alleviate the financial burden of the family members that survive. 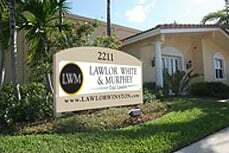 Lawlor, White & Murphey can’t bring your loved one back, but we will do our best to help those who are still living to go on. Lawlor, White & Murphey knows that the reason most people don’t end up talking to a lawyer is that they’re afraid of the cost. How can they even think about trying to pay for an attorney when they’re worried about medical bills? That’s why we never charge a dime to our clients until we recover compensation for them – we don’t get paid until and unless you do. This means that you literally have nothing to lose. Learn more about your options and how we can help you by setting up a free consultation today. Contact us via our convenient online contact form. The compensation you deserve is closer than you think.